iMap Weather includes a live radar visualisation on top of Google Maps. The radar animation clearly shows the current position of Hurricane Alex. Ibiseye use Google Maps to show the path of Hurricane Alex. One very useful feature of Ibiseye is that users are able to click on points along the projected path of the hurricane and find out how close it will be, at that point, to the nearest towns and cities. StormAdvisory use Google Maps to show the track and projected track of hurricanes. The map currently shows Hurricane Alex as an H1 category storm. StormAdvisory also features a news ticker of the latest hurricane news. Wundermap are also using Google Maps to show the path of Hurricane Alex. The Central Florida Hurricane Centre is tracking Hurricane Alex. Clicking on points along the trail of the hurricane reveals wind speed, movement and pressure data. Railroad Empire is a Google Maps based game for Facebook. 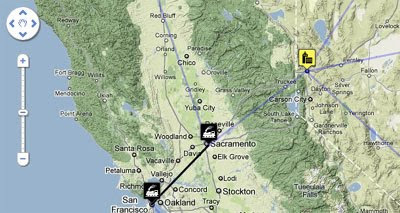 The game uses Google Map as the background for a railroad manager simulation game. In the game you can buy and sell stations, buy trains, schedule your trains to stop at your stations, research improvements to your railroad company and manage your budget. The stations and rail lines that you own are displayed on a Google Map. If you click on your station map markers you can then manage your stations and your trains. That's enough for now - I need to get back to extending my Railroad Empire from San Francisco to LA. I bet you always wished you knew how different people around the world pronounce 'antidisestablishmentarianism'. Well, thankfully, now the wait is over. Forvo is the largest pronunciation guide in the world. Forvo has over a half a million oral pronunciations of words recorded by people all over the world. If you have ever wondered how a word is pronounced in different parts of the world you can now just type that word into Forvo. 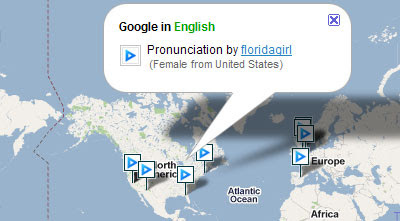 Forvo then displays a Google Map showing you all the available recorded pronunciations of the world and where they were recorded. So if you want to know how an Englishmen says 'Google Maps' just type it into Forvo and select the appropriate map marker from the map. This Google Maps mashup displays the locations of crimes in the Comox Valley in Canada. The map features a useful timeline that lets you refine the crimes shown by any month going back to September of last year. 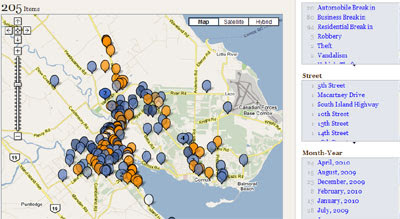 The map also lets you refine the crimes shown on the map by type of crime and by district. It is even possible to select individual streets to view all the crimes committed there in the last year. The map uses categorised map markers to show the type of crime committed. The results of a crime search are all displayed in list form beneath the map, as well as being displayed on the map. The Tokyo Subway and Railway Lines Map lets you view any of Tokyo's many subway and railway lines on a Google Map. It is possible to select any line from the drop down menu. After you have selected a line, if you click 'Select Station', you can then choose from any of the stations on the line. The information window for each station also includes links that will forward you to the next station on the line or take you to the previous station. The map also includes a nifty little current location feature. In the top right corner the current map location is shown in the form of breadcrumb, e.g. country > town > neighbourhood. The day's earthquakes are pinpointed on a Google Map and also displayed by hour in the timeline. 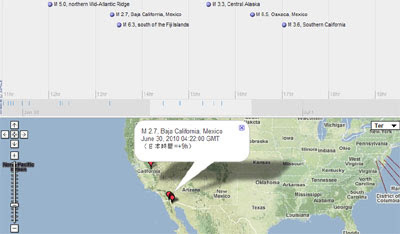 It is possible to select a quake from the timeline or click on its map marker to view further details about that earthquake. This simple but effective map shows Japanese weather and recent earthquake information on a Google Map. Weather symbols are overlaid on the map to show the current weather conditions throughout Japan. You can click on the weather map markers to get further details, such as the current temperature at that location. 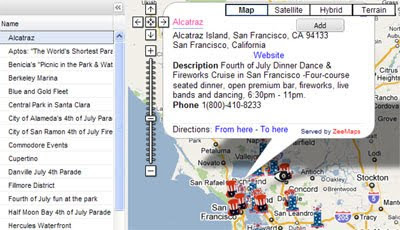 Today the Google Maps API celebrates its 5 year anniversary! Happy Birthday Google Maps API!!! Five years ago the world was amazed when Paul Rademacher's released his Craigslist and Google Maps mashup. Google themselves were so impressed with Paul's hack that they decided to let everyone have a go at creating their own Google Maps mashup by releasing the Google Maps API. It is a testament to the support that Google has provided to the API and to map developers over the years that Google Maps mashups still regularly become front page news. In the UK alone, and in just the last few days, Google Maps mashups have featured in national newspaper The Telegraph and London newspaper The Metro (Historypin and CASA's New Urban Landscapes respectively). When Google asked me at the end of last week if I would help to produce a map of some of the Google Maps that have been created over the years with the Google Maps API I was delighted to say 'yes'! Mappybirthday.appspot is the result of my efforts (with quite a lot of help from Google). The map shows the locations of over 300 Google Maps mashups. If I had another week available I would be able to add at least another 300 mashups to the map. I don't have another week so I apologise to all those wonderful maps that have been missed off. But don't worry! You can add a map to mappybirthday.appspot yourself. Just click on the "Join in the celebration ... pin your mashup to the map!" link underneath the map and enter the details of your map. When you have done that - take a deep breathe because the next five years starts today! Go check out the Google Maps API v3 (if you haven't done so already) ... start creating your next mashup ... and keep submitting your maps to Google Maps Mania. Happy Birthday Google Maps API! Let's hope the next five years are just as exciting. Some of the biggest film stars currently using Twitter are Amitabh Bachchan, Shahrukh Khan and Priyanka Chopra. Thanks to Mibazaar you can now follow all the latest Tweets about these three Bollywood stars in real-time and on Google Maps. The Bollywood Fans Tweets Map shows the latest Twitter messages posted about Bachchan, Khan and Chopra. You can select either of the three stars and then the map will animate through the latest messages about them in real-time. You can even choose which region of the world you wish to view the fan Tweets for. 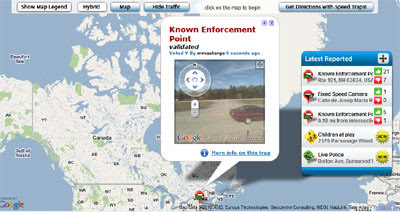 Trapster has added a live real-time map of the latest user reported speed traps. The map animates through the latest reports submitted to Trapster by their 6.7 million users. The latest reports even include Street Views of the speed trap locations. 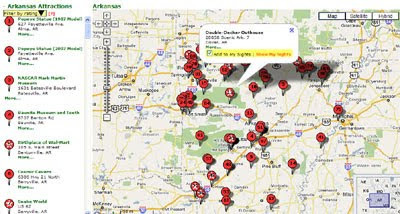 If you click on the map you will be taken to a Trapster map of your location. This map shows all the speed traps in your area. The various traps are categorised into speed cameras, red light cameras, live police etc. Another really nice feature of Trapster is the option to get driving directions. 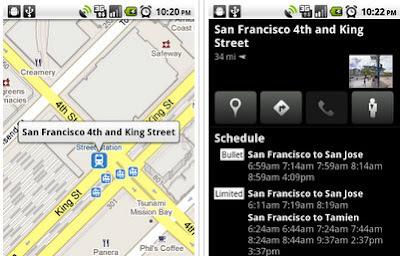 Trapster can give you driving directions between any two points and can show you all the speed traps along your route. This tutorial will teach you how to build a distance finder using the Google Maps API v3. If you want to see what the finished map will look like there is a demo here. The application allows the user to enter two addresses. 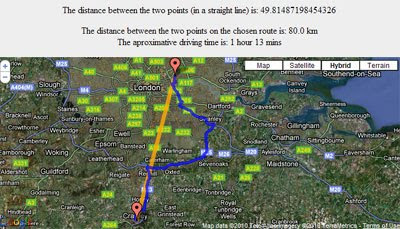 The addresses are then shown on a Google Map with the straight line distance between the two addresses calculated and the approximate driving time shown as well. Calculate the straight-line distance between two points. Google Maps Labs has a new distance measurement tool. If you select the tool from Google Maps a small ruler will be added to the bottom of the map next to the distance scale. The Mercury News are the first off the block this year with their 4th of July Bay Area Celebration Map. The map is an interactive guide to this weekend's Fourth of July festivities around the San Francisco Bay Area. The map includes fireworks, festivals, food, parades, music and much more. If you wish to add another event to the map just click on the 'Add' button and complete the form. For a few months the Centre for Advanced Spatial Analysis at University College London has been harvesting geospatial data from Twitter. One result of collecting this data are these gorgeous visualisations of New York, London, Munich and Paris. The visualisations reimagine the contours of the cities based on the density of people Tweeting at different locations. Mountains represent active locations and valleys represent areas where Tweeting isn't so popular. Areas of the city have been renamed to reflect their Twitter activity. So Times Square becomes Times Square Peak and Picadilly Square becomes Picadilly Rock. Thanks to CASA's image cutter software you can use the Google Maps interface to explore these new city landscapes in beautiful close-up. Foraging maps have certainly become a lot more popular in the last year. 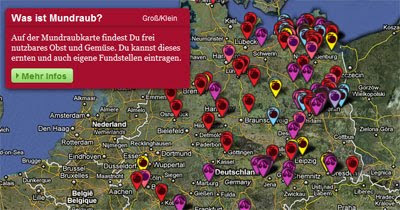 Here's another Google Maps mashup showing where you can pick free fruit and vegetables in Germany. From the map sidebar you can select different categories of map marker to view on the map, these are Berries, Herbs, Nuts and Fruit. Under each category there are a subcategories of map marker showing you the location of the different types of free growing food. For example, the 'Fruit' tab includes markers for apples, pears, oranges, cherries and plums. Of course these foraging maps only really work with effective crowd-sourcing. So, if you know of any German fruit sources that aren't already on map you can fill in a short form and your find will appear on the map. Here's a nice start to the week. Take a leisurely virtual stroll around Seoul listening to the street sounds of the South Korean capital. Sound@Media is a Google Maps based sound map. Users of the map can listen to the everyday sounds of the streets of Seoul directly from the map. The markers on the map show the location where the sounds were recorded. If you live in Seoul and you want to add your own sound recordings you can do so using Audioboo. Tactical Sound Garden - Tactical Sound Garden has created 'sound gardens' in Belo Horizonte, Brazil, San Diego, CA and Zurich, Switzerland. Radio Aporee - Sounds recorded around the world and presented on a Google Map. Neste Oil in Finland have created this Google Map so that drivers can submit their favourite scenic drives. The map features scenic drives not just in Finland but throughout Europe. Users can click on a map marker to view details of the submitted routes and can vote for their favourite drives. In the bottom left hand corner of the map the top ten drives, as voted by users of the map, are displayed. Clicking on any of the top ten drives will open the information window for the drive. The map is in Finnish only. 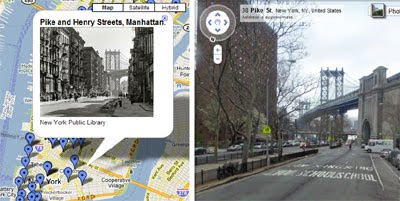 Then & Now is a mashup of historical photographs from Flickr and Google Maps Street View. In essence the site places historical photographs on Google Maps and shows the same location as it is now via Google's Street View imagery. Recently Then & Now had added a number of photographs of New York from the New York Public Library. The site also features a number of historical photographs of Australia and New Zealand. UK housing charity, Shelter has produced a special World Cup edition of their Christmas Street View House Decoration application. 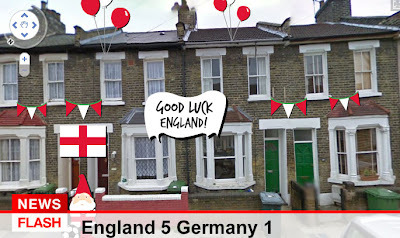 The World Cup edition allows you to decorate your house in Street View with England flags, banners and messages. You can see my prediction for today's England vs Germany game in the screenshot above. My prediction for the England vs Germany game (despite the typo in the screenshot above) is 4-1 to the Germans. Shelter also have a Strip 4 Shelter fund-raising campaign running during the World Cup. Please give generously. The New South Wales Government, in Australia, has just announced the winners of its recent Apps4NSW competition. The competition was aimed at 'stimulating innovative and beneficial use of NSW information'. Not surprisingly Google Maps featured promisingly in the named winners. Australian mapping blog All Things Spatial, as ever, has been very kind in sharing its knowledge of the winners with Google Maps Mania. Demographic Drapes was named joint winner of the competition with Suburban Trends. 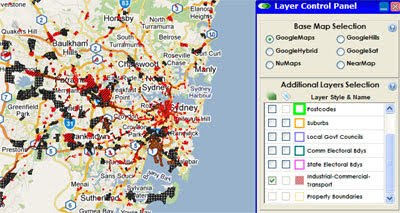 Demographic Drapes is an OpenLayers application using Google Maps. It includes a number of thematic layers with pollution statistics and various administrative boundaries. Suburban Trends is a very impressive thematic mapping application with ABS population statistics and various crime related information. The Google Map makes great use of dynamically loaded vector polygons of suburbs and the Google Chart API. Bike Community Hub won second place in the competition. 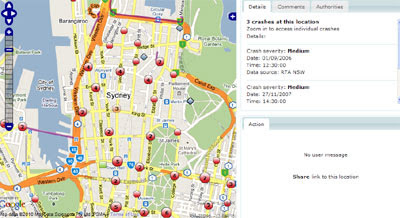 The site features a Google Map showing the location of all road accidents featuring cyclists. The map uses numbered map markers to show the location of accidents involving cyclists and to show how many accidents there have been at each location. In this way cyclists are able to see at a glance where accident black spots are located. 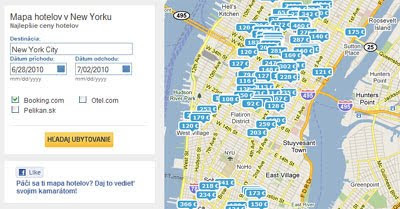 This Google Maps mashup is catering to a small but distinct market, Slovak speakers who are looking for hotels in New York. If you are a Slovak speaker and you want to stay in the Big Apple then you aren't going to find a better hotel guide than newyorkcity.sk. One great feature of this map is that the hotel rates are displayed directly on the Google Map. With this feature it is easy to zoom in on the area you wish to stay and quickly find hotels within your price range. Each hotel map marker includes a link to a detailed review of the hotel. If you like the sound of the review you can then book a room via a link to Booking.com. Pegman, the Google Maps Street View icon, like most people in South Africa these days, goes nowhere without his vuvuzela. Pegman always likes to wear the appropriate clothes for the occasion. If you visit Street View around the All England Tennis Club in Wimbledon you can catch Pegman in his smartest tennis whites. During the French Tennis Open Championships however Pegman normally has a slightly more colorful tinge. Last year Pegman celebrated Gay Pride in San Francisco by dressing even more colorfully. Earlier this year Pegman even put on his morning suit on the occasion of his marriage to Pegwoman. Over the years in fact Pegman has dressed up in his Oirish green, as a Panda, and has even sported skis during the Winter Olympics. However my favourite costume has to be Pegman's moon landing gear. Tonight's partial lunar eclipse is best seen from the Pacific in the middle of the night or in the western U.S. just before dawn. The upcoming July 11th total solar eclipse will be seen to best advantage in the South Pacific. The simulation uses two instances of the Google Earth plug-in, one showing the Earth and the other the sky. You set your location by clicking on the Earth, set the time by clicking on the green timeline, and start an animation by clicking on the timeline's arrow. Use the drop-down menu on the bottom right to view other eclipses. 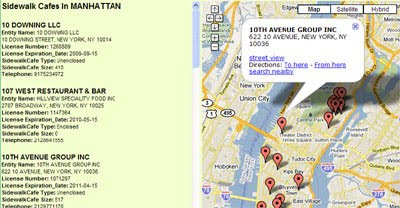 Look into NYC uses data from a number of different NYC agencies to provide a Google Maps based search portal to public and private establishments in New York. Currently the application lets you search for Computer Centers, Electronic Stores, Hiking, Horseback, Ice Skating, Nature Centers, Recreational Centers, Sidewalk Cafes, Pools, Tennis Courts, Queens Library Branches and a few other categories as well. 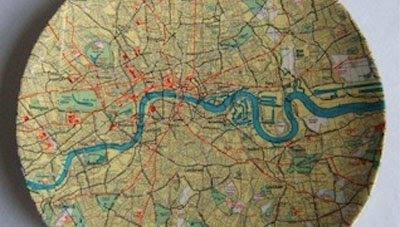 Users can search the map by borough or by specific address. Users can also refine the radius within which they wish to search. The results are then displayed on a map and listed in the map sidebar. Each point of information displayed on the map includes options to view it in Street View and to get directions. Bitty have animated a few consecutive Street View images of two guys spotting the Street View car and quickly assuming their coolest poses. If you check out Street View around the Wimbledon Tennis Club in London you will find that Pegman has once again donned his best tennis whites. Know any UK cartographers? If so they might appreciate a present of this London Map Dish. Although, at around $71, it isn't cheap. 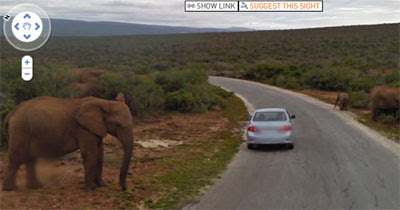 When you are Street View car driver in South Africa one of the things you have to watch out for is elephants crossing the road. Yes, it's another great elephant find from Google Sightseeing. The latest Google Search Story is called 'Graduation', although it could just have easily been called the 'American Dream'. I'm embedding it here, firstly because I like it and secondly because it highlights the usefulness of Street View when searching for property. Today a lot of people have decided to spend their time queuing outside Apple Stores. Whilst queuing an inordinate amount of potential customers have been Tweeting from their old iPhones. Apparently it's incredibly exciting. 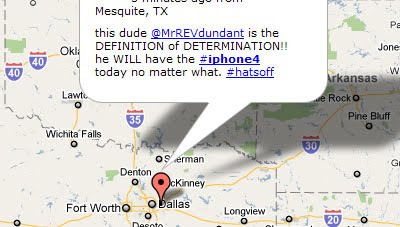 If you haven't been able to spare the time to stand in line then you can replicate the experience with this iPhone4 Tweet map. Mibazaar's map animates through the latest Tweets to mention Apple's phone. So now you too can imagine that you are stuck in a queue outside a shop listening to a bunch of mobile phone phreaks rhapsodise about a little a bit of plastic. And if I had an iPhone4 I would be busy Tweeting about it as well. And I do love Mibazaar's animated Tweet maps! 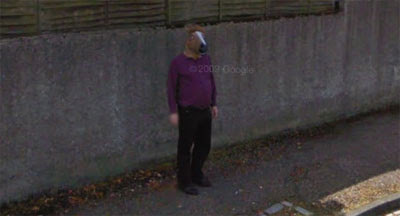 This weird man with a horse's head found on Google Maps Street View has gone viral today. 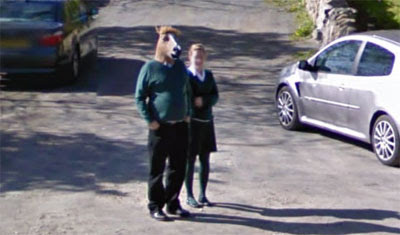 Yesterday Street View Funny posted this image of a strangely masked man. 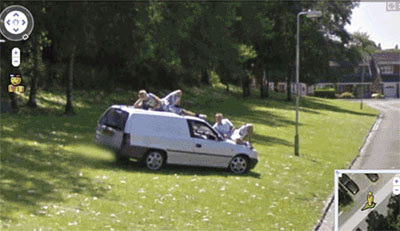 Later the story was picked up by the BBC (without crediting Street View Funny). The BBC story has now shot straight to the top of their 'most read' stories list. The BBC say they have been inundated with e-mails from readers all over the world who claim to have seen or met the horse-headed man. Other readers have e-mailed in to suggest that they might have met completely different men who just happened to have bought the same mask. Google Sightseeing however have found Horseman elsewhere in Aberdeen. 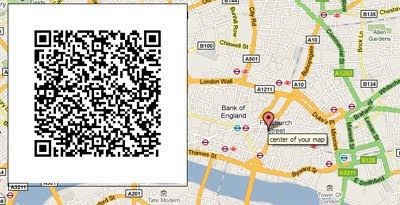 This Google Maps mashup helps you create a QR code for a location just by centring a Google Map on your address. Once you have created the code you can place the image on your website or printed material. Then anyone can simply scan the image and bookmark your location to their smart phone, all at the drop of a hat. To create a code jut let the map determine your location. You can drag and zoom the map to refine your exact location. If you mouseover the map marker you can preview your QR code. If you click on the link in the marker's information window you will be taken to a dedicated page for your code. The page includes the html code to insert the QR code image on your own website or blog and a link to a static Google Map of your location. QR codes created with this mashup can be placed anywhere; on your website, on your business cards, on leaflets or even hung on the wall. Use-It Europe create free printable city guides for young travellers in Europe. The guides are packed full of information about the night-life, cultural hot-spots and place to eat. The guides also contain handy city maps. 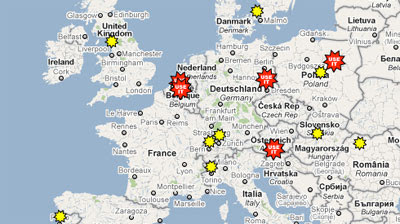 To give you a quick visual guide to which European cities currently have guides available Use-It have created a Google Map. 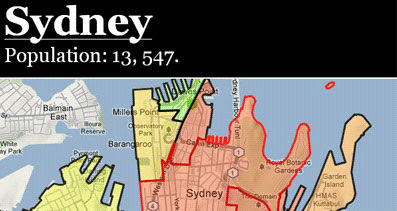 The red Use-It star markers show which cities you can download PDF guides for. The yellow markers show you where city guides will be available soon. Retrails Trails Co-op is a compendium of over 35,000 American trails ranging from National Parks and Forests hikes to local mountain bike trails. 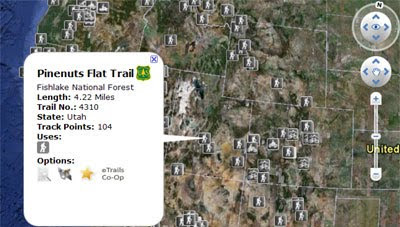 The individual pages for each of the trails includes a Google Map showing the route of the trail. Alongside the map are the trail's details, such as its length and elevation profile. If you zoom the map out you can also view trails that are nearby. If you select the 'viewer' option you can view all the trails on a Google Earth browser plug-in map. 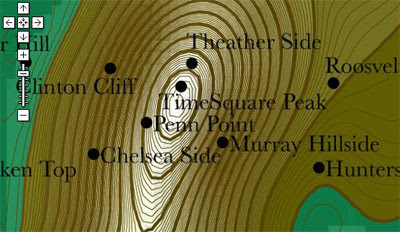 Here the location of the trails is shown with map markers which indicate if these are hiking, biking or climbing trails. I'm not sure what happened in Toronto today. Trendsmap is no help at all. Whilst checking out how Trendsmap was coping with the Toronto earthquake I discovered they have a great World Cup Twitter Trends Map. You can use the map to keep up with what everyone is saying about the teams, players, coaches, and every match as it happens! According to the map someone called Landon Donovan has become very popular all of a sudden. The UK Met office has released an events calendar that will feature key sporting and other events taking place through-out the year and provide key weather information. The calendar currently features the World Cup in South Africa, Wimbledon and the Glastonbury festival. When you click through to view individual events you are presented with a Google Map with a number of weather related layers. You can choose to view rainfall, the temperature, weather, UV and the pollen count directly on a Google Map of the event. From the World's largest twine ball to an obscure monument to a patriotic pig, RoadsideAmerica.com is a great website to help you explore the weird and wacky side of America. The site has indexed over 9,000 offbeat tourist attractions and have produced a number of Google Maps to help you visit them for yourself. The Roadside America Maps page links to 50 state interactive Google Maps. There are also treasures waiting to be disinterred in the Pet Cemetery, a Video Vault, Global Attractions and a Hall of Immortals. The markers on each of the maps are categorised into 'reviews', 'visitor tips' and 'hotels'. The attractions are also listed in the map sidebar and you can filter the markers by 'The Best', 'Major Fun', 'Worth a Detour', 'Worth a Stop' and 'Mildly Interesting'. If you like the look of a particular offbeat tourist attraction you can add it to your 'My Sites' list. Bookmarked attractions can then by viewed on your very own 'My Sights' Google Map. Here is a map for all lovers of Chinese food. The map shows Chinese restaurants for the whole of the United States. You can search the map by dragging and zooming the map or by entering an address in the search bar. Alternatively, if you are searching for a specific restaurant, you can search for restaurants by name. If your favourite Chinese restaurant is missing from the map you can add it and your rating and review will be added to the map. Google Maps for Android version 4.3 has added new features to help you quickly choose the right place to grab dinner, catch the next train, and find friends to add in Latitude. 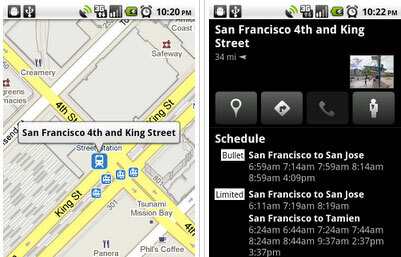 Public transit station pages have been given a boost with Google Maps for Android 4.3. Now if you select a transit station icon on Google Maps you will find a handy list of the next departure times for trains, subway trains, and / or buses. The new version of Google Maps also makes it easy for you to add friends to Google Latitude. At the bottom of your Google Latitude friends list you will now find a link to add more friends from your contacts list. Google have also made it easier for Android users to get reviews of places. Instead of taking you straight to full reviews of places, with Google Maps for Android 4.3 you will now see color-coded review bars giving you an overview of what people think about the location. If you tap one of the review bars you can get more details like the actual review snippets. Toronto is hosting a G20 summit on June 26-27. CBC.ca have produced this Google Map to show how venues, areas, and routes will be affected during the summit. The map shows the location of all the checkpoints that will be in operation, areas that will be restricted and the various zones that will be in operation. The demonstration zone is clearly shown on the map, as is the protester detention area. A number of TTC Routes will be affected during the summit. It is possible to view all the affected lines on the map and get details of how they will be affected. CBC.ca have also created a Google Earth browser plug-in tour of the summit location. The U.S. Chamber of Commerce have created a protest Google Map as part of its lobbying campaign against the financial-overhaul legislation in the U.S. Congress. 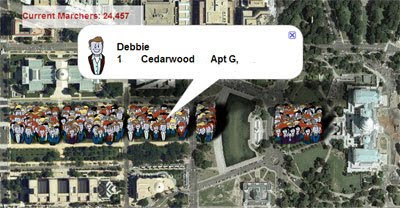 24,000 people have already placed map markers on the satellite image of the National Mall on Google Maps. The idea for the campaign is clearly inspired by the Taksim virtual protest against internet censorship in Turkey. The U.S. Chambers map has markers that reveal the name and location of the person who placed it. It is possible to change the map to view the markers mapped by the protester's address. It is also possible to select to view only protesters from a particular state. Google Maps mashups based on Transport for London data are now coming thick and fast. Last week Tfl, the body responsible for public transport in the UK capital, released a Transport for London API. Yesterday we saw the Live London Underground Map and, this morning came, Live Line, two mashups built on real-time train positions on the London Underground network. This afternoon I found this traffic webcam map for London. 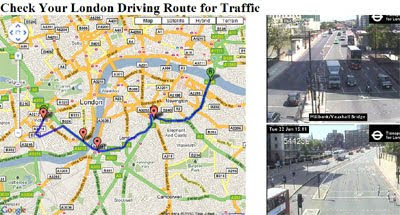 The map lets you get driving directions for any route in London and then view all the traffic cams along the route. This allows drivers to see at a glance how much traffic is on the roads on the planned route. This is a great idea that I don't think I've seen implemented elsewhere. Considering that traffic cam feeds are fairly abundant around the world I have a feeling a lot of map developers will jump on this idea and create something similar for other cities. At least I hope so. 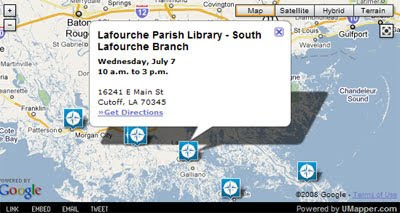 The Our Home, Louisiana Coalition is a partnership founded by Blue Cross and Blue Shield of Louisiana to provide support to the people of the Louisiana Coast who are affected by the crisis in the Gulf. Starting on June 22 the Coalition will be holding 12 Coastal Care Fairs beginning in Grand Isle and continuing through the summer. The fairs aim to bring employment information, health resources and other assistance to those whose lives have been affected by the Gulf oil spill crisis. You can find out where and when the fairs are being held on Our Home, Louisiana's Google Map, featured prominently on the site's home page. WM-Mania has gone World Cup mad. They have produced a number of Google Maps based pages to help German's support their team. The main page includes a Google Map displaying over 16,000 Sky Sports bars in Germany that are showing the World Cup games. You can click on any one of the bars to Tweet to your friends where you are watching the game. Each marker also includes a link to a details page about the bar, where you can also post a message to Facebook. The main page features a live Tweets stream that shows all the latest Tweets sent from the site. The Stadium Special page lets you view the Google Maps Street View for each of the World Cup stadia. 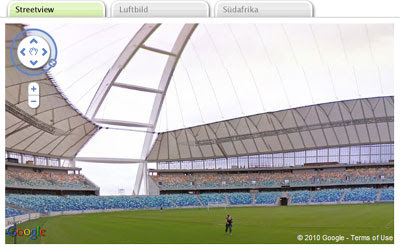 The page also includes information from Wikipedia about each of the stadia and the latest photos from Flickr. You can also view the results of matches played at each one of the stadia and view the upcoming fixtures. If by this time you are a little tired of Google Maps you can head over to the Schedule page. Here you can view the latest group tables, the fixture schedules and the match results. WM-Mania is a joint project from Ubilabs and Sky-Sport-Bars.